Grow your dream business with elegant and user-friendly design that inspires your target audience. I specialize in design solutions for passionate small businesses. Get in touch to learn more about Shopify ecommerce websites, responsive websites, graphic design, and branding. Increase your sales with a mobile friendly Shopify online store that communicates your brand aesthetic and personality. Ask about Shopify setup, custom design, and implementation services. Communicate your brand promise and update your own content with a clean and user-friendly WordPress website that appears elegantly across desktops, laptops, tablets, and smart phones. Reach your target audience effectively with distinctive branding, logo design, and graphic design for print collateral. Get in touch for a complimentary consultation to discuss your business goals, and cultivate a reliable partnership for ongoing marketing needs. 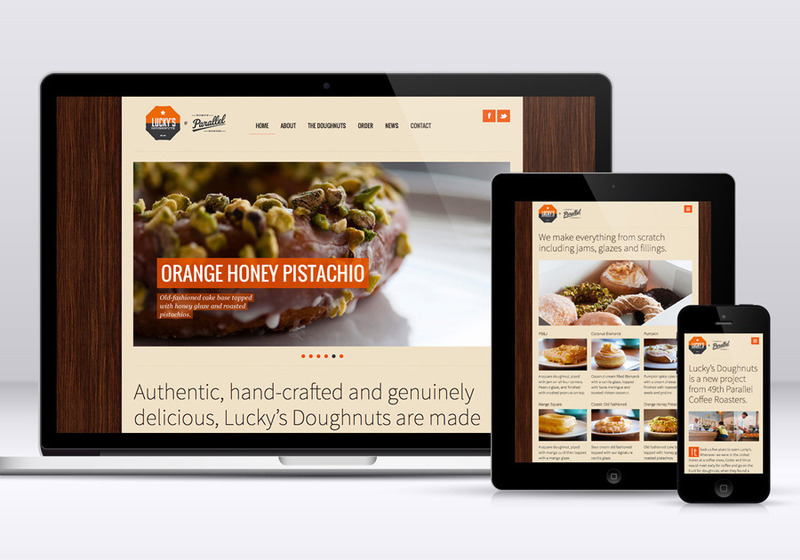 Responsive website for Lucky’s Doughnuts at 49th Parallel Café, a doughnut shop and café in Vancouver, BC.